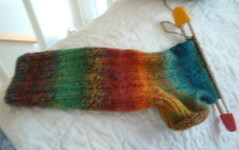 I really love how this sock is turning out. The colors are so much fun! I'm finding myself wanting to start a new project though. I was thinking about a scarf. I love Midwest Moonlight from Scarf Style, so I may start that, but not sure which yarn to use... hmmm, I may have to think about that for a bit. Well, not much going on here. Just work and kids and a little knitting in between! that's a great sock! i love the color. Oh the colors are great! What kind of yarn are you using on this one?